The 6´7" Studd was trained by wrestling legend Killer Kowalski. Studd made his professional wrestling debut in 1972. 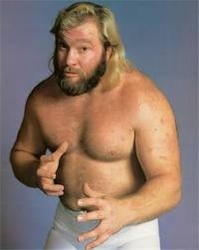 He worked in the WWF in 1972 under the ring name "Chuck O'Connor." He feuded with El Olympico and faced Pedro Morales on TV in a non-title match, losing when Morales got him in a Boston Crab submission hold. O'Connor defeated many jobbers in squash matches. At Showdown At Shea, he lost to El Olympico by disqualification. Later, he fought Jay Strongbow and Gorilla Monsoon. By late 1972 Studd left the WWF and went on to other promotions. In 1976, Studd returned to the WWF and fought as Executioner #2. Studd and Killer Kowalski won the WWF Tag Team Championship. After leaving the WWF in 1977, Studd became known as Captain USA at certain points in the Mid-Atlantic territory. In 1978, Studd teamed up with Ken Patera to win the Mid-Atlantic Tag Team titles. Studd also made occasional trips to Canada to wrestle in Emile Duprée's Atlantic Grand Prix Wrestling. After this, Studd was brought into Florida by J.J. Dillon and feuded with Dusty Rhodes, Barry Windham (the son of Blackjack Mulligan), and Sweet Brown Sugar. 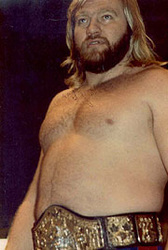 In early 1982, Studd gained several unsuccessful title shots at the NWA World Heavyweight Championship, which was held by "The Nature Boy" Ric Flair at the time. Studd jumped to the World Wrestling Federation in late 1982, and was paired with manager "Classy" Freddie Blassie. Studd quickly became a monster heel, adopting a gimmick of bringing a stretcher to the ring and beating his opponents so badly they would be taken out on the stretcher. While Studd became a top challenger for the WWF World Championship, held by Bob Backlund, it was his feud with André the Giant that earned him main event status. Studd and Blassie had issued a "Bodyslam Challenge," offering $10,000 (and later, $15,000) to any wrestler that could slam him before boasting that he (Studd) could not be slammed. After several wrestlers were unsuccessful in answering Studd's challenge, Andre accepted and was about to slam Studd before Blassie attacked Andre from behind (as Studd grabbed the ring ropes to prevent himself from being slammed). The Andre-Studd feud raged throughout 1983 and Andre got the upper hand and slammed Studd several times, once with enough force to collapse the entire ring. Several times, the two met inside a steel cage, where André not only slammed Studd, but used a sitdown splash from the top rope onto his chest to knock him out. Despite this, Studd began declaring himself the "True Giant of Wrestling," all while continuing to insist he could not (and had never been) slammed. By 1984, with his feud with Andre still raging, Studd was challenging then-new champion Hulk Hogan for the title; Hogan was also successful on several occasions in slamming Studd. Studd was also paired with Bobby "the Brain" Heenan, who helped take the Andre-Studd feud to new heights. This happened during a televised tag team match featuring Studd and fellow Heenan Family member Ken Patera against André the Giant and S.D. Jones. The match ended by disqualification after persistent rulebreaking by Studd and Patera, who attacked André afterwards and cut his hair. André set out for revenge and accepted Studd's challenge to a "$15,000 Bodyslam Challenge" match at the first WrestleMania, whereby if Andre failed to slam Studd before the time limit (or Studd managed to slam Andre), Andre would be forced to retire from wrestling. André won the match although Studd protested. After WrestleMania, Studd formed an alliance with the 468 lb (212 kg) King Kong Bundy. The two attacked André at a WWF house show in the summer of 1985, injuring Andre's sternum. The Studd-Bundy alliance and André continued to feud for the rest of that year and into 1986, with Andre often recruiting faces such as Hogan, Tony Atlas, Junkyard Dog and Hillbilly Jim to team with him. Studd participated in the well-publicized 20 man over-the-top battle royal that took place at WrestleMania 2 and featured in a memorable pre-match interview with Gene Okerlund and then Atlanta Falcons player Bill Fralic, with Studd telling Fralic he had no business in professional wrestling and Fralic calling Studd "Dudd". The battle royale also featured stars from the National Football league. Although André the Giant was also in the battle royale, Studd set his focus on eliminating William "The Refrigerator" Perry, who was fresh from a Super Bowl victory that year. Studd successfully eliminated Perry during the match, only to have Perry to eliminate Studd while the two were shaking hands. André went on to win the battle royale. The Andre-Studd feud took on a new dimension in 1986, when—in the wake of Andre's increasing health problems related to gigantism and acromegaly, and his planned tour of Japan—a storyline was developed to have Andre compete in a tag team called The Machines. The "Machines" angle began when Andre failed to show up for a tag team match against Bundy-Studd at a television taping. Heenan successfully campaigned to get Andre suspended, only for Andre to reappear shortly thereafter in a mask and billing himself as the Giant Machine. 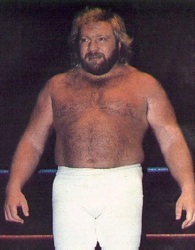 Studd, along with Bundy and Heenan, insisted that Andre and the Giant Machine were one and the same, and set out to prove their point by vowing to unmask the Giant Machine during a series of tag team matches; the Giant Machine's partners included Blackjack Mulligan (as "Big Machine") and Bill Eadie (as "Super Machine"). However, neither Studd, nor Bundy or Heenan, were able to unmask the Giant Machine. Studd, who long had a reputation of not suffering wrestlers with little or no in-ring skills, wrestled a notable match with the "World's Strongest Man Ted Arcidi during a televised house show at the Boston Garden in mid-1986. During the match Studd was noticeably wrestling stiff and showing contempt for someone he saw as nothing more than a muscled up weightlifter with no wrestling skills who had no business being in a professional wrestling ring. The Bundy-Studd team also feuded with other established WWF tag teams in 1986, including The Islanders, and contended for the WWF Tag Team Championship held by The British Bulldogs. During a televised match in late 1986, Studd and Bundy began arguing after they lost a match to the Bulldogs, and although that seemed to foreshadow a feud between the two, nothing ever came of it. Studd's last match during his original 1980s WWF run came on the November 15, 1986, episode of WWF Superstars of Wrestling, where he teamed with Bundy to defeat The Machines (a match that did not involve the Giant Machine). Despite leaving the WWF, Studd's presence was still made known in a WWF Magazine article published shortly before WrestleMania III, where he supported Andre in his upcoming match against Hogan (contending that Hogan's friendship with Andre was a ruse, to duck him as a potential challenger to the title). After retiring for two years, Studd announced his return to the WWF on the Brother Love Show in late 1988. An elated Bobby Heenan appeared on the set to welcome Studd back to the Heenan family. However, with Heenan now also managing his old adversary André the Giant, Studd rejected the offer and ran Heenan off the Brother Love set, thus turning face. 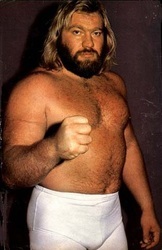 Studd went on to feud with several members of the Heenan family, including André who had turned heel during Studd's absence. Studd won the 1989 Royal Rumble in Houston, which many consider to be the crowning achievement in his WWF career. Studd then served as a special guest referee in the match between Jake "The Snake" Roberts and André at WrestleMania V in Atlantic City. Studd and André had several words with each other both before and during the match and eventually disqualified his nemesis after the giant attacked him from behind. Studd's last match with the WWF was June 4, 1989, with Hillbilly Jim wrestling in Studd's place later that month.